I’m going to be sharing some of my favorite football snacks with you this week. Here’s the second installment! You can find the first installment here. I have some first-world-problem complaining to do today. Nothing major. Just a mini vent sesh? If you listen, I’ll repay you in pot stickers. That seems like a fair deal. I hope. So, you see, I’m basically traveling all the way to Hawaii to work for ONE AND A HALF DAYS and then flying home. It’s going to be brutal. Yes, I get to go to HAWAII. Yes, I get to stay at a Four Seasons resort for free. Yes, I’ll be surrounded by breathtaking beauty. It will be an amazing experience…but also a draining one. If you follow me on Instagram, I’m sure you’ll see a flow of tropical-esque pictures. Sorry? Just remember that I’m probably stumbling around the resort like a sleepwalker with a killer sunburn (I’m so pale right now). Not to mention the cruelty surrounding the fact that I have to wear a bathing suit in February. In front of people. Yeah. Let that marinate. Ugh. I know I’m being a TOTAL brat about the whole thing. I’m sorry. I really am grateful that I get to see Hawaii….and not pay for it. I really am grateful for my job and my clients and all that jazz. I’m just a bit daunted by this trip. 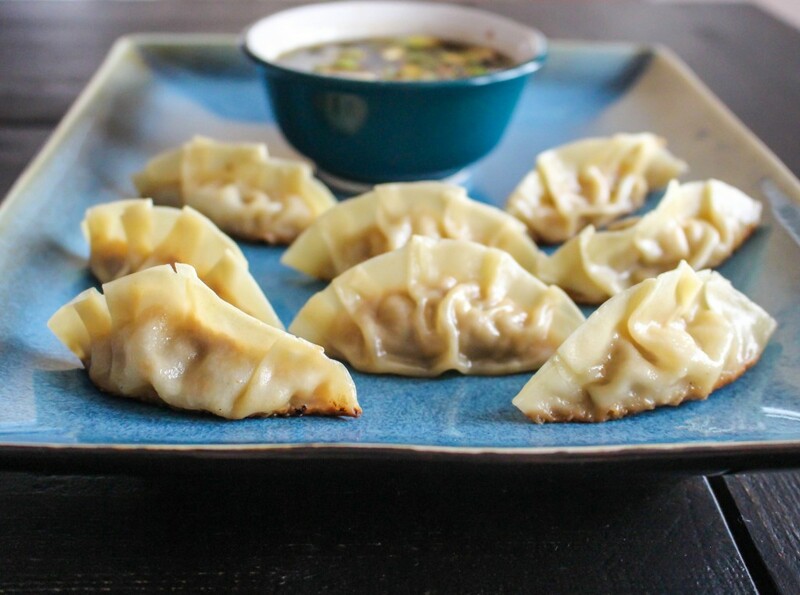 These pot stickers are so delicious and such a fun snack to have for a party or a football game (like the big one coming up on Sunday – which I’m missing because I’m working. More complaining. OK, I’m done now. I swear). They are surprisingly easy to put together. They look impressive, don’t they? 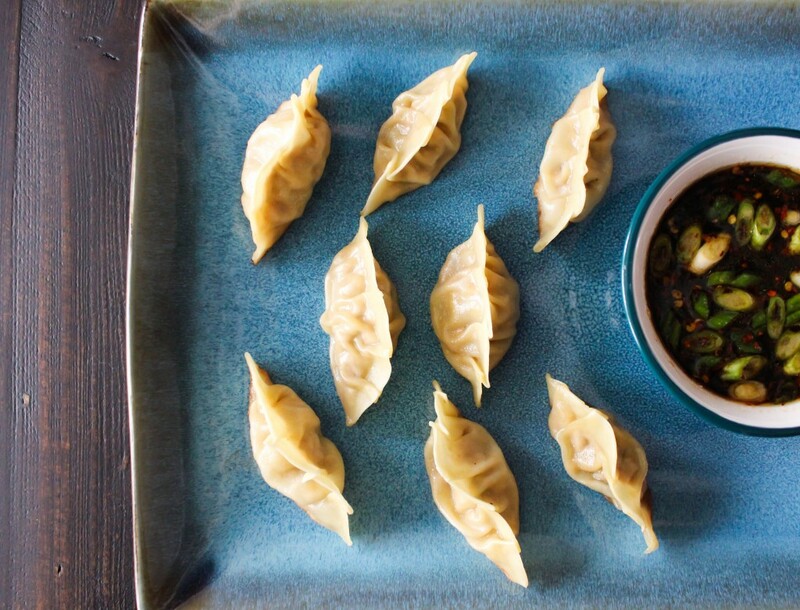 Once you master the dumpling technique (it takes a couple tries), you’ll be good to go. Here’s a great instructional post/video on forming these little guys. If you don’t feel like doing the ruffled-edge look, then just fold them and pinch the edges together so they’re sealed. They’ll still taste good! I decided to go with a pork and apple filling because the flavors just GO together. Plus, I love the mouth feel of pork in dumplings/pot stickers. The fat keeps everything moist and juicy. I threw in some other classic Asian flavors, and the result was incredible. They may be small, but they are PACKED with flavor. The dipping sauce is no slacker, either. I definitely recommend serving them with this sauce. 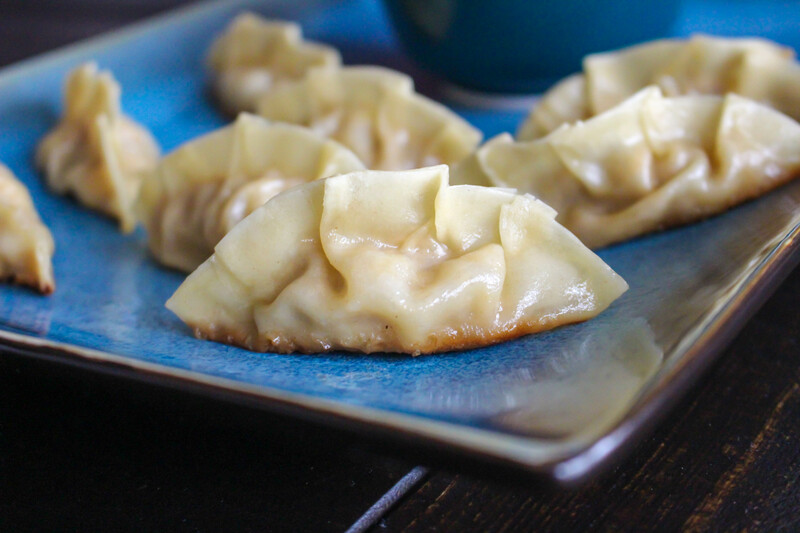 This recipe is perfect for a crowd because it makes A TON of pot stickers. I think I ended up with like 60! The two of us managed to eat them all, too…over the course of a few days. I’m telling you, they are SO GOOD. Make these for the Super Bowl this weekend. They’re a fun twist on the regular “tailgate” food. Have some (like, a dozen?) for me. Poor little old me. Stranded on the island of Lanai. In February. Heat the oil in a large skillet over medium heat. Add the onion and apple and cook for 5-7 minutes or until softened. Add in the garlic and ginger and cook for another minute. Add the rice wine vinegar and apple juice and cook until the liquid is mostly evaporated, about 5-10 minutes. Remove from heat and allow to cool. Once cooled, combine the apple-onion mixture with the ground pork in a large bowl. 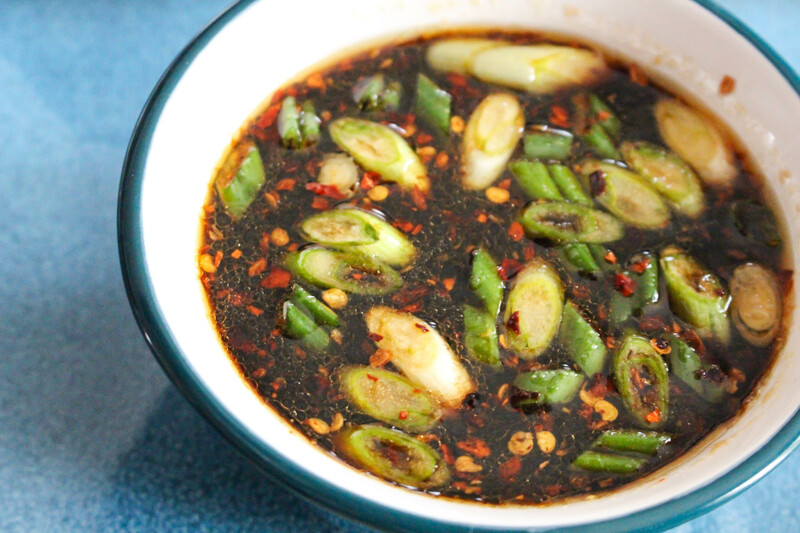 Add in the soy sauce and chopped scallions and stir to incorporate. Chill in fridge for at least 20 minutes (keep cold until ready to use). 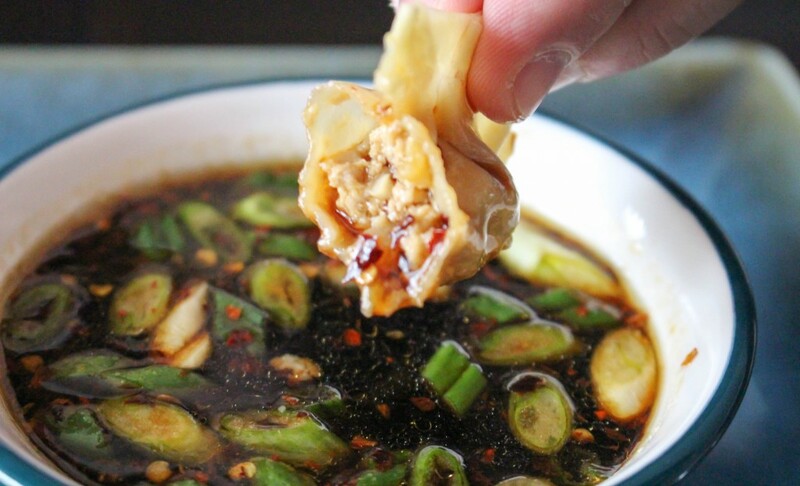 To form the pot stickers, lay wrappers on flat working surface and lightly brush edges with egg wash. Place ½ tablespoon of the filling in the center of each wrapper and fold over in half, sealing the edges with fingers by making small pleats. Gently press the pot stickers down on the work surface to flatten the bottoms so they stand upright. Place formed pot stickers on a parchment-lined baking sheet until ready to cook (They also can be frozen at this point on a parchment-lined baking sheet. Once frozen, store them in plastic bags). Wipe out the same skillet used to cook the apple-onion mixture and add canola oil to coat the bottom. Heat over medium-high. 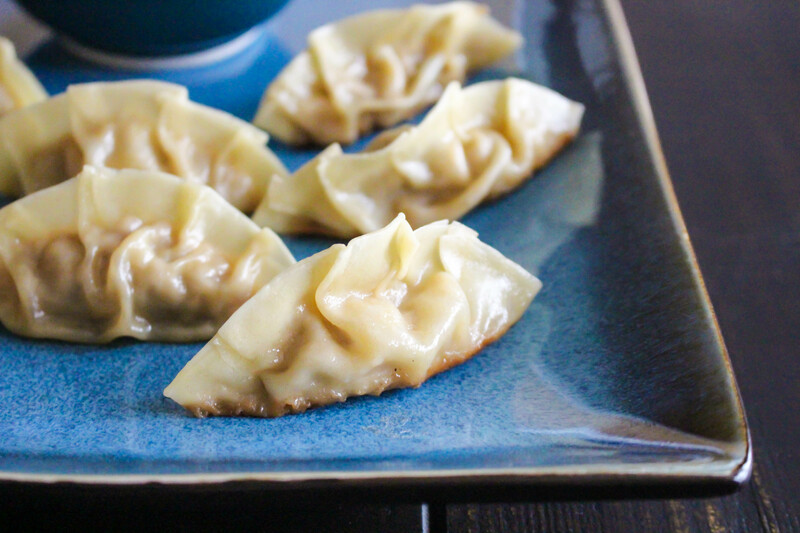 Working in batches, place the pot stickers, flattened side down, in the oil and cook for 3 minutes (do not touch them during this time – this will create a crispy bottom). Add ¼ cup of water and immediately cover pan to avoid any splattering. Steam until the pot stickers are puffy yet firm and all the water has evaporated, about 5-7 minutes. Remove lid and cook for an additional 1-2 minutes so that the bottoms can retain their crispiness. Transfer to a serving platter and continue with the remaining pot stickers. Serve warm with the dipping sauce. Note: Dumpling wrappers can be found in the produce section of your grocery store. Along with wonton and eggroll wrappers, they are often near the tofu.